Draper Lofts Apartments offers modern apartments in the unique setting of a meticulously restored historic school building. Oversized windows and high ceilings provide sunlit rooms. Modern kitchens include stainless steel appliances, microwaves, and nickel-finish fixtures. Find plenty of space to relax with a newspaper. In the community room, enjoy comfortable seating and spending time with your neighbors. Step outside to relax in the park-like interior courtyard with barbeque areas and seating. If you are craving exercise, check out our fitness center with cardio equipment and space to stretch and practice yoga. Sidewalks and landscaping create the perfect ambiance for a morning stroll. 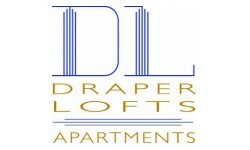 Draper Lofts is situated in a walkable residential community with nearby shops and restaurants. Conveniently located in Rotterdam NY, Draper Lofts is in a walkable residential community with nearby shops & restaurants near Schenectady.